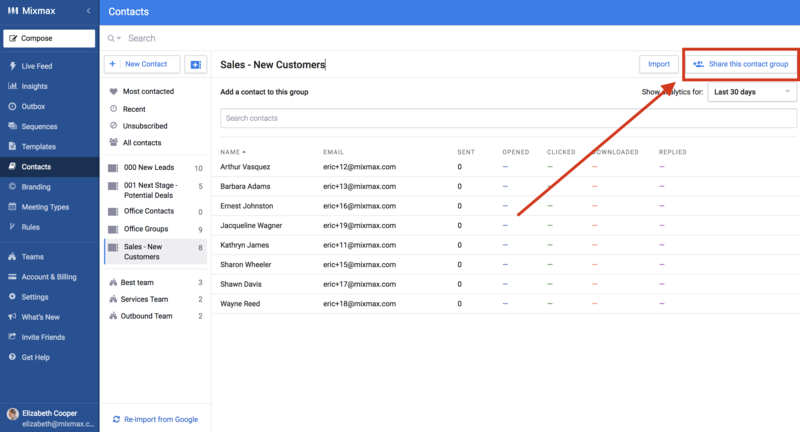 Teams in Mixmax are a great way to share content, track performance, and learn what's working best across your organization. 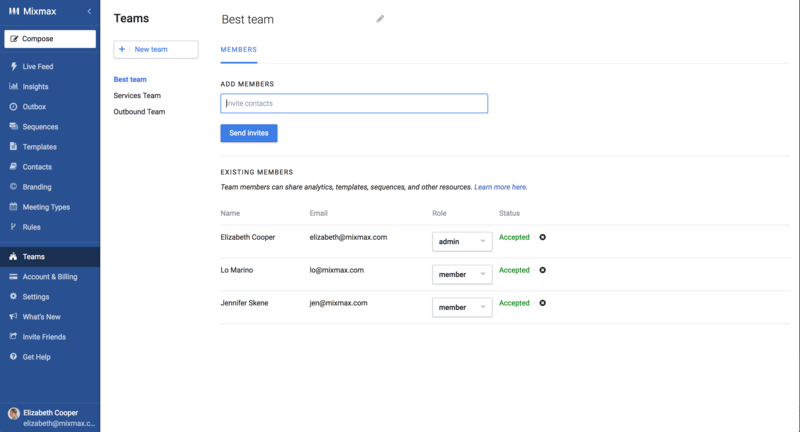 Any user can create a Team and you can set up different Teams across your organization. In the Mixmax web app, click Teams in the left column to open the Teams page. Click the New Team button in the upper left to get started. Give your Team a name and invite people to join. Inviting new team members is as easy as typing in their email address and clicking 'Send Invites'. 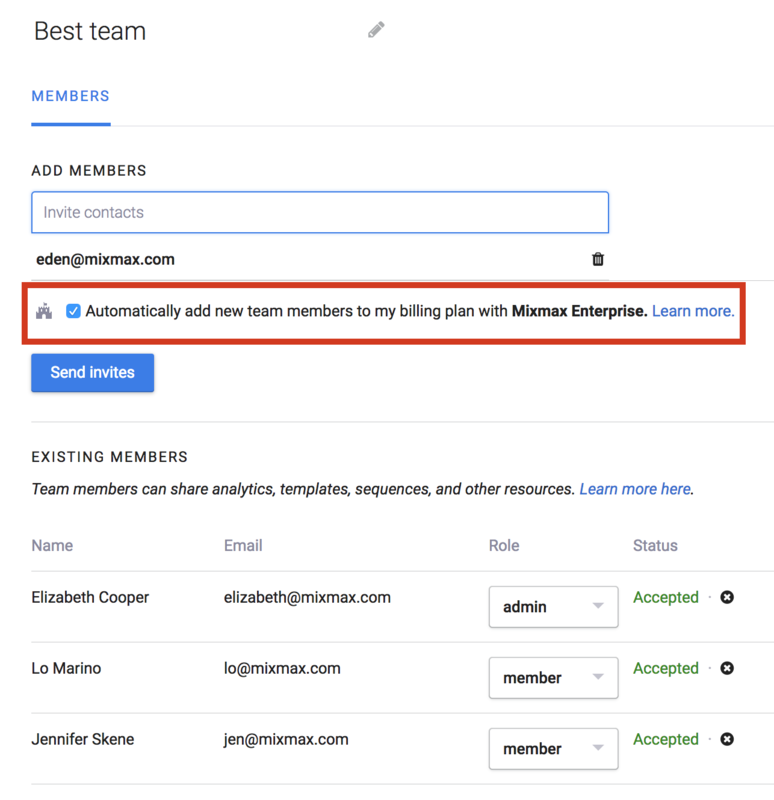 If you want team members to be added onto the same subscription plan, you can make sure the box is checked before clicking Send Invites. 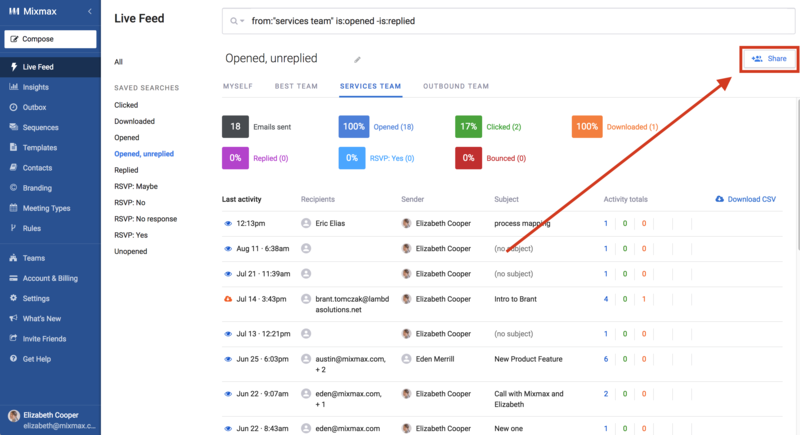 If the team member is on the same domain as you, they'll automatically be added to your team and they don't have to do anything special to get set up. If the team member is on a different domain, they'll receive an email invitation asking them to accept. Note - Only team admins will have the option to invite additional guests. Admins also have the authority to change another member to an admin and remove an existing team member. Team members will be able to see other members and leave the team. Who can contribute to the Team Live Feed? 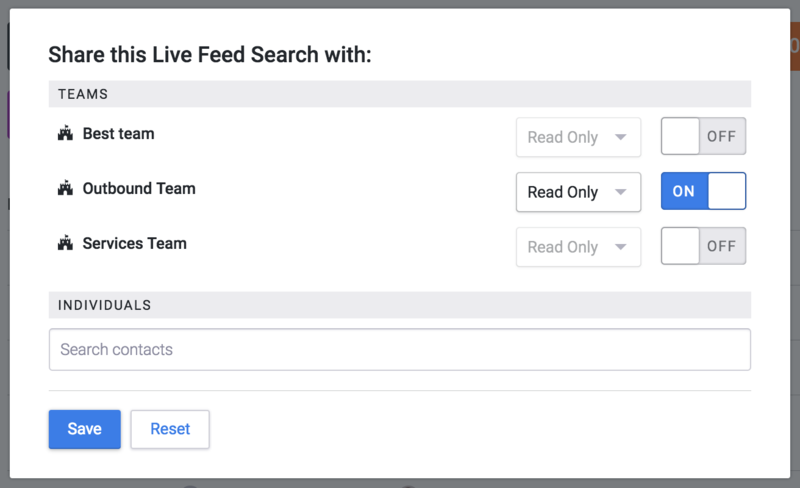 Note that while any Mixmax customer can see a Team Live Feed, only team members with Small Business plan and above can contribute to the team Live Feed. 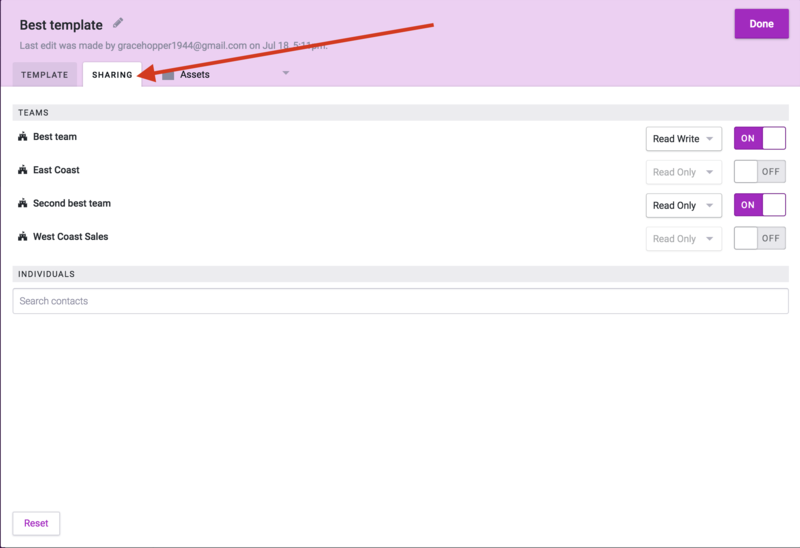 Emails sent by team members on Free or Starter will not appear in the team's Live Feed. You have the option to share any contact group with all members on your team. When you're viewing a contact group, you'll see a button to share in the upper right corner. When you click that button, we'll show you a window where you can choose which Teams to share with. You can also choose to give Read Only access or Read and Write access. All your saved searches in the live feed will be available in the left column. When you're viewing a saved search, you'll see a Share button in the upper right corner of your dashboard. When you click the Share button, you'll be able to share the search you're currently viewing with your team. 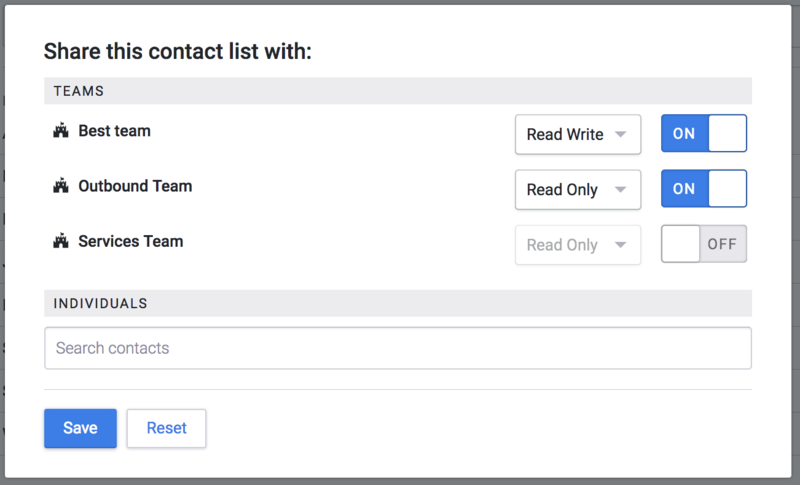 Just like contact groups, you can give your team Read Only or Read Write access. Templates are slightly different from contact groups and the live feed because you can share individual templates or entire template folders. To share an individual template, open up an existing template or create a new template. Behind the compose window you are viewing, you should see a Sharing tab. In the templates tab you will see the familiar team listings. 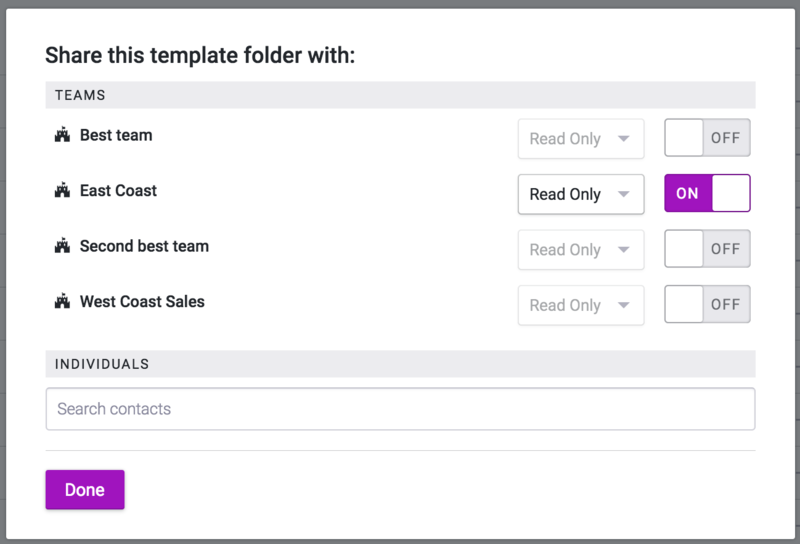 You can also share entire template folders with your team, which will share all of the templates within the folder. When you are viewing a folder you'll see the share button positioned in the upper left corner. In the pop out window, you'll see the option to share the template folder with your various teams. Giving read only access means the other team mates you're sharing with will be able to view and use all of the templates within the folder but cannot change them or add new templates. With sequences, you will see the option to share right before you activate the sequence. Sequences can be shared as Read-Only or Read-Write. With Read-only your teammates will be able to use the sequence and send from their own accounts but they cannot make changes to the stages. With Read-write your teammates will be able to make changes to the content of the sequence. 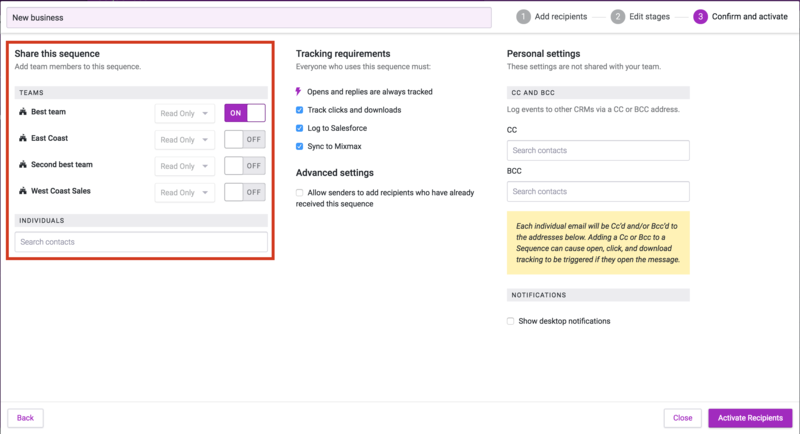 To share a sequence, turn on the team switch in step three of the set up process, right before hitting 'Activate Recipients'. You can learn more about setting up your sequences here. You can also share a sequence after it has been activated from the sequence settings. 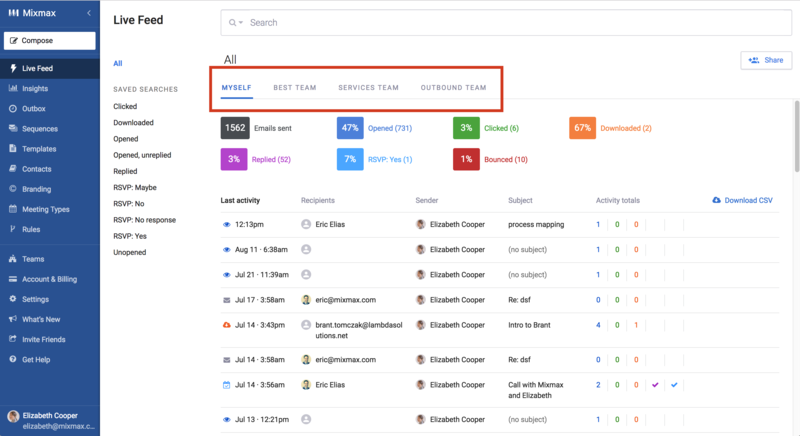 On the Growth and Enterprise plans you can view insights to track email and meeting activity across your team. On the Enterprise plan, you can customize the Insights search parameters. For example, you can check how well a particular sequence or template is performing across your team. You can also use Insights to determine who has the best relationship with one of your contacts. 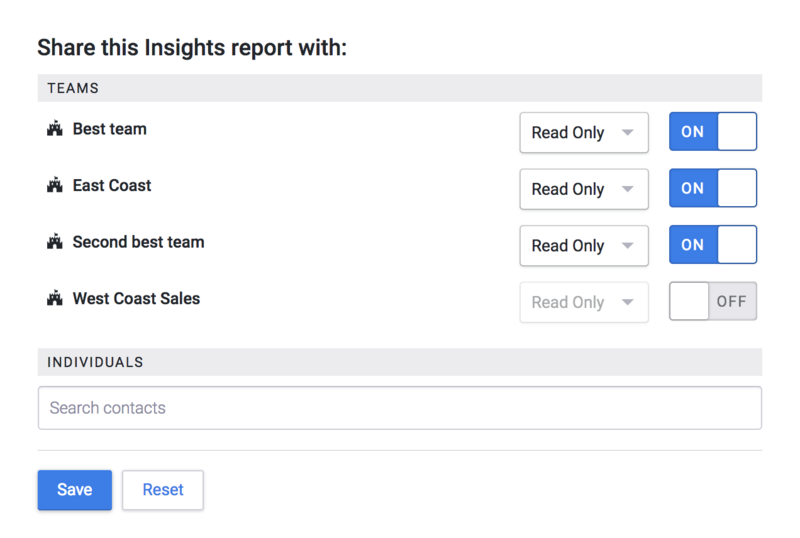 When you create a custom Insights report, you'll see a button in the upper right corner to share the report. Just like the other resources, you will see a window that allows you to select which teams you'd like to share with. When you're looking at the Live feed, you'll notice below the search bar each team has its own heading. When you click on one of the headings, you will see all of the tracked activity for all users on that team. You can use the Search bar above to find specific details for your team. For example, you can choose to only view opened and unreplied messages for. On our Growth and Enterprise plans you can access Insights for your team to understand how each individual is performing. When you navigate to the Insights tab you'll details for all your teammates. 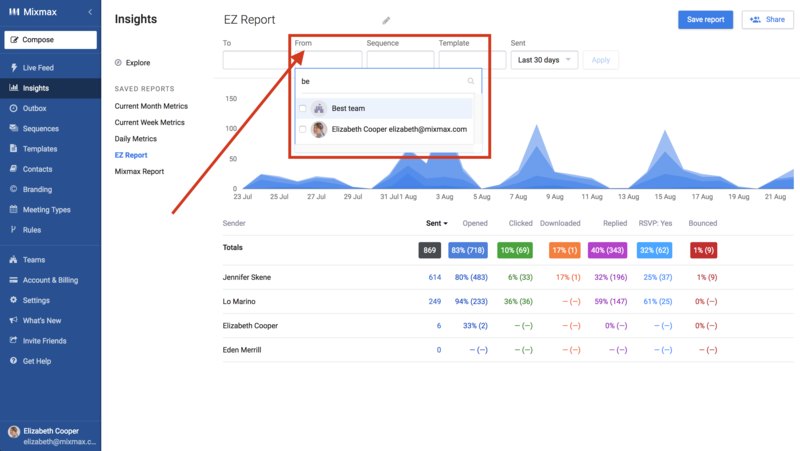 On the Enterprise plan, you can create custom searches in Insights and save reports for later.